Here is a picture of a North Western Loline, RDB 873, taken in 1965. The offside illuminated advertisement appears to be still in use. The NWRCC Lolines came in two forms. Numbers 872 to 881 were fitted with the ‘D’ type four speed gearbox, and Nos. 882 to 896 had the ‘B’ type five speed. Despite this tidy fleet numbering sequence, production of the two varieties took place side by side at the Dennis works. The last Loline delivered to North Western was four speed number 880, chassis number 1060. I cannot now recall exactly where this picture was taken, but I am sure that our Manchester area experts will soon provide the answer. 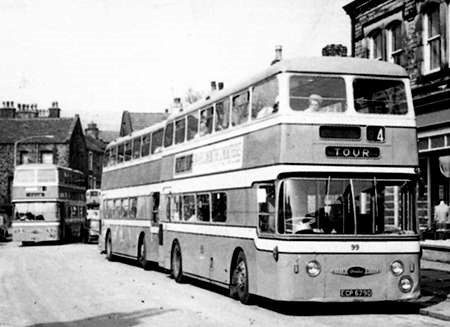 The first two Loline III buses went to Leigh Corporation, and these had the chassis code Y2. All subsequent production, starting with Aldershot and District 394 COR, were numbered from 1001 using the chassis code detailed above. Bus Lists on the Web shows the Halifax buses having the code for the Dennis rear axle, whereas they actually had the Bristol unit. Roger the location is Altrincham on Stamford New Rd having just crossed the level crossing from Stockport Rd. Approaching Altrincham station/bus station, the blind is already set for the return trip. Thanks, Phil. I was pretty sure that you would be able to identify the location. The semaphore signals are an interesting legacy from the steam age. The line behind was actually electrified as the overhead wires indicate although steam did run on it as well. It was the Manchester, South Junction & Altrincham line which is now part of Metrolink. There are still plenty of semaphore signals about on secondary lines today although their numbers are dwindling. Back to the bus – I always thought these were very attractive vehicles and so solid looking with their low chassis line. The photo also reminds us what a smart livery the North Western red and cream was. The Alexander Lolines – like the East Lancs Renowns – are attractive, balanced designs. Strange then that Alexander Lowlanders were such a dogs’ breakfast. Stranger still that the Met Cam and Weymann Lowlander design seemed to work. Now no one picked me up on a post a year or two back – so I’m throwing it out again in the hope that some expert will back it up or shoot it down. Is this Alexander design their own final evolution of the Weymann Aurora which they built under licence for a number of operators – notably Glasgow and Liverpool – in the ’50s? PS: Just to reinforce Phil’s opinion of me; Sheffield 861-880 were also attractive Alexander bodies of this ilk but they were highbridge. It’s lowheights where most of the disasters happen. The Lowlander was a tricky proposition for any body builder as it was a half-hearted attempt by Leyland at a low-height front engined bus at a time when its main thrust was on the Atlantean. By using the PD Titan front end it left the body builders with the problem of marrying the high engine and cab onto a low height rear end. Probably Northern Counties made the best stab at it. Philip is absolutely correct. Leyland fudged the issue with the so called low height version of the Atlantean which, in its own way, was as much of a compromise as the low height bodies on traditional chassis had been. It saw its market potential diminish as AEC and upstart Dennis offered the Bridgemaster and Loline, and later the Renown, which had the perceived advantage of a traditional layout at the time when many operators were nervous about the Atlantean. 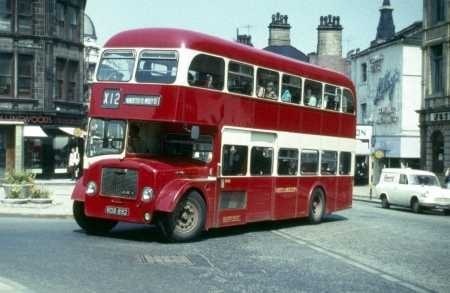 Whilst none of these set the world on fire and Leyland’s salesmen did a sterling job with both operators and bodybuilders in selling the low height Atlantean bodge, the demand for a traditional chassis capable of carrying a low height body remained and many operators wanted it built by Leyland. So what did they do? As Philip says, they came up with another half hearted attempt and Alexanders made a bodge of bodying it. Daimler solved the problem and won significant orders with its drop centre rear axle (something Leyland could and should have used) on the Fleetline, killing off all the front engined competitors (apart of course from the "protected" Lodekka) and diminishing the sales of the Atlantean in Leyland’s traditional heartlands. Phil B’s excellent analysis aside, I always think style and design are such personal tastes, and ignoring nostalgia, of course, I’ve always thought that these were extremely attractive vehicles and, as Phil H pointed out, all the better for NWRCC’s tasteful colour scheme…. Have any survived – haven’t seen one on the rally circuit, ever…. Stuart, they looked even better in the Crosville green with black wheels and the large Crosville titles after the break up of NWRCC and before they were daubed with the NBC insipid imitation. They put all but Crosville’s coach versions of the FLF in the shade. According to this site www.dennissociety.org.uk/ RDB 872 has survived, but the lack of recent information about it might be rather worrying. I have many happy memories of riding on these Lolines in the late sixties. My favourite operator was Crosville, but as I lived in the Manchester area, a visit to Crosville’s area involved a journey to Warrington as a starting point. Usually I rode from Manchester to Warrington on North Western service 36, invariably on a Loline III. The section from Manchester to Altrincham was limited stop, and the bus was usually almost empty. It was a novelty to ride through Stretford and Sale without stopping. Beyond Altrincham we were in semi-rural surroundings, with quite a turn of speed. The gearbox made quite a loud shrieking noise, which combined with the Gardner road to add to the character of these buses. My return journey from Warrington was usually on Salford/LUT service 10, a far less interesting route although it was nice to ride on a Guy Arab. North Western also had 15 Loline II’s with East Lancs bodies. These were good looking but didn’t have the same character, especially as all but three had Leyland engines. I just can’t get used to the heavily domed roof on these Alexander bodies. Apart from looking odd, it deprives upper-deck passengers of a view, and it certainly contributes to the "Albion" Lowlander’s grotesque appearance. Very grateful for Loline chassis code list. All is now clear! Ian, I’m not sure why you think the domed roof deprived upper deck passengers of a view. The header picture on this thread clearly shows it doesn’t on the Loline, either to the side or forward and, as for the Lowlander, whilst the a tall front seat passenger may have had a problem and those behind certainly would have, looking forward, as the front seats were raised to accommodate the cab, the view to side was as good as on any other body – and I rode on both types in service many times. I did, however find the domed look a tad overpowering. Just to expand on my previous comment regarding the X12 service. When I was younger I lived just outside Halifax beside the Bradford road along which the X12 passed, and took particular note of North Western’s buses as they were ‘foreigners’ and a bit mysterious as we locals were not able to use them as they snootily shot past all the stops. When I was very young back in the mid-1950’s the usual vehicles were fairly new bus-liveried Weymann-bodied Tiger Cubs, but I can recall Bristol L-types, Royal Tigers and the occasional Olympic and PD1 and PD2, and even a rebodied prewar K5G – that must have been ‘downer’ for all involved ! Then in the late 1950’s/early 1960’s it became the norm for the latest ‘blacktop’ DP’s to be used – at first the LDB-reg Weymann-bodied Reliances, then the later RDB-reg Willowbrook-bodied ones. On Summer Saturdays in particular it was still not at all unusual to see L5G’s right up to the time the last ones went, as well as any other thing they could muster whilst the DP’s were duplicating coaches on the longer services. The Weymann lowbridge PD2/21’s were by then also frequently used. I can remember seeing the occasional Alexander-bodied Reliance ‘coach’ and even an Aberdonian once. Then for quite a while in the 1960’s the Weymann-bodied Reliances seemed to reappear and become the standard issue once again – by then demoted to bus livery and converted to OMO with A-suffixes to their numbers. These lasted until being superseded by new Marshall-bodied RESL’s, which were most impressive at the time, then briefly brand new Alexander Y-type RELL’s. Lolines and the occasional Fleetline increasingly turned up at weekends. As far as I can recall it was only in the early 1970’s that the Alexander Y-type Leopards began to be used, at the same time that YWD’s share began to be operated under the guise of West Riding using similar vehicles. Yorkshire Woollen mostly used Olympics throughout the 1950’s, helped out by the lengthened PS2/Willowbrooks, though Brush-bodied PS1’s were often substituted at weekends. 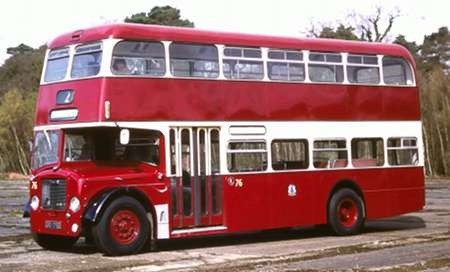 From 1960ish they started using mostly BET standard Reliances, but once again at busy times they would often put on double deckers – particularly the PS1/Orion super lightweight rebodies, and later the ‘reshortened’ and rebodied PS2’s. In 1972/73 I used the X12 for the greater part of my daily commute from Halifax to Salford, when I worked for SELNEC. By then it was very unusual for NWRCC to use anything but Y-type Leopards, but I mostly rode on the West Riding/YWD workings and they generally provided ex-YWD Leopard Y-types of the GHD-G batch, occasionally the much nicer and more comfortable Plaxton Derwent-bodied Leopards, and if one was unlucky YWD’s KHD-K batch of Marshall-bodied Leopard service buses, which were extremely uncomfortable with their spartan, low-backed and tightly spaced bus seats, hard ride and hideously clashing and lurid orange and red interiors. Very occasionally there would be an Alexander or ECW-bodied Fleetline. And all sadly now a distant memory. 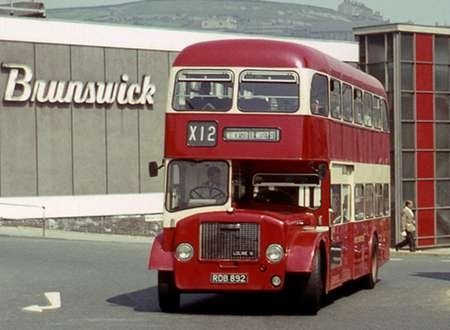 John, as far as I can recall the Alexander Y type bodied Leopards ran out of the North Western Manchester depot on the X12 for a period when new. This would have been in 1963 (not 1962 as I originally stated) and probably not for a great length of time, nor more than one return trip on any day. The purpose was to both "run in" vehicles and give drivers familiarisation. When new the Y types were first used pretty much exclusively on the night time London services so were available during the day and I recall both boarding a Y type for London which had arrived at Lower Mosley St as an X12 half an hour before, had gone to the depot for fuel and returned with the blind showing X12, as well as travelling on one as far as Oldham. Replying to David Oldfield’s question about the relationship between this Alexander design and the Weymann Aurora, all I can say is that I am finding more and more that resemblance, like beauty, is in the eye of the beholder. 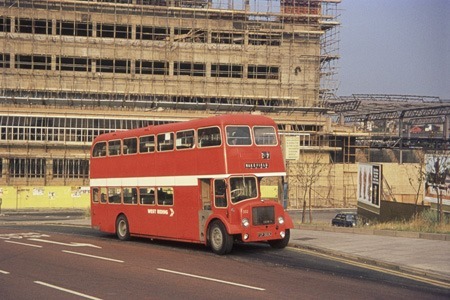 Personally I regard this design as an evolution of Alexander’s own previous double deckers, as exemplified by this one http://sct61.org.uk/afrb135 . I’m trying to get a perspective on the first picture. Was the man at the rear of the bus a midget? The picture was taken using a Zorki 6 camera with a standard 50 mm lens at the junction of Broad Street and Waterhouse Street, so the perspective is a natural one. The Loline is turning into Waterhouse Street en route for the main pick up point in George Street (if my septuagenarian memory still serves correctly), and the man is well behind the bus on the far side of Broad Street. I haven’t visited Halifax for several years, but looking at the site now on Google Earth, I find it barely recognisable. Yes Roger, it’s all changed. The building in the background was the Brunswick Bowling Alley, opened by onetime Coronation Street actress Pat Phoenix in February 1964. There was a car park on the roof accessed from Weymouth Street on the far side, and when first built it featured a 14 feet high fibreglass bowling pin on the top – above where the stair block can be seen on the right. There was a deluge of objections to this ‘monstrosity’ and the council made them take it down after six months. Its popularity quickly waned, and it closed in November 1969, when it became a Presto supermarket. There was a failed attempt to reopen it as a bowling alley again in 1986, then it remained disused until 2003 when cheapo supermarket chain Netto took it on for a while. After standing increasingly derelict for quite a while it was demolished in 2009, and a new ‘entertainment quarter’ – The Broad Street Plaza – was built on the site, featuring a multiplex cinema, 24-hour Gym, a Premier Inn hotel, expensive multi-story car park and more national-chain eateries than a town could ever need. Swift’s machine tool factory on the distant Claremount hillside is long closed and gone, as is the prominent row of houses on the skyline behind. If you have ever negotiated this bit with its one-chance lane-changes, you know that it is all steeper than it looks here, I think: so the perspective can play tricks? I’m with Jim on this one – could that chap have been Jimmy Clitheroe? Many thanks for that fascinating account of local history, John. I visited Halifax a few times up to the early 1970s, when I then discovered the totally insensitive eyesore of Burdock Way scything its way across the Hebble valley, utterly overpowering the superb structure of North Bridge. The philistines who sanctioned this brutalist excrescence should be chained, like Prometheus, to rocks on Beacon Hill, and evermore subjected to the sound of Stockhausen’s ‘music’. So, Roger (01/12), the X12 didn’t run via the Crossfield Bus Station towards Manchester? I agree, it does look as though the bus is turning left towards George Square [sic], but as the Bradford-Halifax section was a 2-hourly extension on a 1-hourly Halifax-Manchester service (according to my 1970 YWD timetable) then missing out the bus station doesn’t make sense as alternate journeys would have served different "starting points" in Halifax, and my timetable shows Crossfield Bus Station as the timing point in both directions. I think the bus is too far across the junction to turn left to George Square . . . its just snaking round the right-turn into Orange Street, after which it will continue up-hill then right-right into the bus station, then out of the bus station and eventually appear in front of the Presto (as I knew it) heading towards the left of where it is currently pictured. Were things different earlier? Careful now, Roger, there must be admirers of the Stockhausen genre, even on this website – maybe David O! Myself, I think it’s an affront to ‘uman Rights! Student to Thomas Beecham: "Have you heard any music by Stocjhausen Sir Thomas?" "No, dear boy – but I believe I once stood in some….."
At one time buses aiming for Cross Field Bus Station from the lower part of Broad Street would continue across the junction with Waterhouse Street/Orange Street into the upper part of Broad Street, turn right into St. James Road, then into the Bus Station. Then a one-way system was introduced whereupon the upper part of Broad Street was made one-way downwards, and these services – along with all through westbound pre-M62 traffic – had to turn left into Waterhouse Street (as the Loline is doing here), right into Silver Street, then an awkward very sharp right into Cow Green and finally following the eastbound traffic flow to reach St. James Road and the Bus Station from the other direction. Later the upper part of Broad Street became two-way again, but a central island prevented reinstating the turn into St. James Road. Cow Green was widened and an island put along the centre also, preventing the right turn from Silver Street, and so services then simply turned right from lower Broad Street into Orange Street,then immediately left into Great Albion Street, left into St. James Road and the Bus Station. So the X12 was on its way to the Bus Station as the timetable stated, and all of which will probably mean nothing unless you know Halifax ! Impossible to trump that, David O! ‘Admirers of the Stockhausen genre," Chris? Setting aside the likes of Boulez, for whom music is a branch of mathematics, such characters are surely rare indeed. No doubt they are the same people who think that Yorkshire Tea is grown on the sunny south facing slopes above Hebden Bridge. Meanwhile back on subject with Philip, Crossfield Bus Station was a gaunt, inhospitable place, very poorly sited for the bus services of the town. Several routes, such as the 48/49 Hebden Bridge – Brighouse service, used it in one direction only. I seem to remember that the X12 in the mid 1960s did not serve Crossfield Bus Station towards Manchester, but picked up in George Street. If John thinks that my memory is suffering the structural failure of time, then I accept his greatly superior knowledge of the Halifax scene. Here, however, is a picture of Loline 892 turning into George Street from Commercial Street. This shot has been shown on OBP earlier, but it is repeated here to illustrate the point. Great picture of RDB 873, which was an Altrincham Depot based Lowline in the 60/70s, RDB 872 to 881 were all based at Altrincham. The picture shows 873 has just crossed the level crossings, and about to arrive at Altrincham bus station, they were mainly used on the Stockport & Warrington runs, 873 was a great drive!!! good old days, Ex Altrincham driver!!! One Roger to another; it’s good to see another Loline fan on this site. I drove the Aldershot and District 6LW engined examples, many of which had the same style of Alexander bodywork as the NWRCC buses. The Loline was a superb machine, in my view an advance upon the excellent Lodekka from which it was derived. One regularly sees the comment all over the place that the Loline was merely a "licence built Lodekka". It wasn’t; in house components were generally used, and Dennis re-engineered several features of the design, notably the braking system, which was full air operated in place of the Lodekka’s air/hydraulic type. Most of the production had Dennis transmissions, and the gearboxes were lighter to use than the heavier Bristol equivalents. It deserved to sell far better than it ultimately did, though some of the blame must lay with the Guildford firm itself for its strangely wavering commitment to marketing the model. Thanks for enlightening us about the Altrincham allocation. It seems that all the four speed Lolines were based at that one depot. I never rode on one of those, but the five speeders on the X12 over the Pennines from Yorkshire to Manchester could really fly. There were two routes from Stockport to Altrincham, the 71 via Cheadle and Gatley and the 80 via Heaton Mersey and Didsbury. I lived on the latter and regularly travelled on the Lolines until they were replaced on most turns by Fleetlines and Renowns. Talking to crews they only had two complaints, at least in the first few years of service: the doors which were temperamental and, from a large number of drivers, the angle of the steering wheel. As NWRCC always felt it had been dropped into the wrong camp when nationalisation came along and deprived it of its beloved Bristols, the engineering department really liked their Leyland engined MkIs, the engines bought for spares commonality, and were overjoyed when the the Gardner engined versions appeared and the MkIIIs were ordered in enough quantity to make the engine switch economically viable. Phil, the Gardner 6LW and 6LX options were available in the Loline from its early Mark I days, so North Western could have had the Mark II/6LX version from the start. Perhaps BET group purchasing policies, which sometimes overruled local company preferences, dictated the use of Leyland engines in the first twelve of the Mark IIs, but the last three had Gardner power plants, so local opinion clearly prevailed in the end. The angled steering wheel did require a bit of getting used to, but after a short while it seemed entirely natural, the driving position being similar to that found in private cars. In the days before powered steering, reaching the far side of the wheel to apply the lock in tight corners was far easier than leaning across the flat wheel of Leylands and their like. This comment was sent yesterday but got caught in the spam filter, it is usually very good. If you ever send a comment and nothing happens please let me know by plain email (ie no links in the text). John, going back to our posts of the 2nd, so things were different earlier then! Now to Roger’s post: the Burdock way was “forced” on the town because its situation in a narrow valley prevented a conventional by-pass, so the only solution was up-and-over the town centre – as it stands, what you see is only Phase 1 of what was planned (and in a much toned-down form) . . . for the full horror (errm, surely utopian vision?) of what the planners had in mind go to www.cbrd.co.uk, and http://wikimapia.org/11168283/ for a map of the destruction that would have been caused if the scheme had been built in full. Then the M62 was opened and traffic through the town centre fell considerably, so that was it. Meanwhile, as Roger says, whilst car drivers were whizzing around on the fancy new by-pass bus passengers would have been enduring the delights of Crossfield bus-station . . . where they could stare at a painted panel of a weeping (from its headlights) blue Calderdale JOC Loline pleading “I’m blue because I’ve no driver” or a DP Seddon RU/Pennine advertising the 68/X68 to Sheffield (two of Halifax’s rarer bus types) – both over-painted in Verona green sometime after 1974 (more mindless destruction). Roger, the use of Leyland engines in the MkIIs was, as I understand it, a Charles St decision, mainly to have commonality with other vehicles in the fleet though I suspect there was perhaps a degree of mollifying the BET powers that be, having found the nearest thing to a Bristol, and bearing in mind the Atkinson saga less than ten years before. Many thanks, Philip, for that informative note, and the links, about the Burdock Way horror. The more I read about this project, the greater I become convinced that it was fundamentally an ego statement, a sort of northern precursor of Boris Island, by "A Prominent Councillor" (to use the expression of the website). In an age when road building for the private car was king, this grandiose idea was seen by local dignitaries (none of whom, I bet, lived in the areas blighted by the road) as a project to "Put Halifax On The Map". When I went to work in Halifax as a 23 year old, I lived in a bedsit in Swires Terrace, a part of the old town which would apparently have been obliterated by Phase Two of this barbaric scheme. I consider that superior alternatives, involving properly thought out link roads to the M62, would have better resolved the east- west through traffic problems. The mere existence of this Burdock Way excrescence must have generated through traffic that would otherwise have gone elsewhere. The north – south flows between Keighley and Huddersfield surely cannot have posed insuperable problems within Halifax. My home town of Croydon embarked upon a similar brutalist scheme in the late 1950s and early 1960s, carving a north – south dual carriageway right through the Victorian town centre. Like the Halifax effort, all this achieved was to move and exacerbate the congestion at points on the edges of the town where the scheme fizzled out. The ultimate verdict on its success may be judged by a present day proposal to pedestrianise the greater part of it. With a bit of luck, the Halifax viaduct monstrosity across the Hebble Valley will succumb in the near future to the high alumina cement worm. I would willingly buy a ticket to watch and cheer as it came down. When I was a 17 year-old, 1955-56, I had a girlfriend in Croydon and used to get the trolleybus across Mitcham Common as part of my journey. The centre I had a modest knowledge of. A couple of years ago, I had to go there and went on the tram from Wimbledon. I recognised nothing of the town centre, apart from some shops on the right-hand side on the way out, by tram again. All the character had gone. My wife’s home town, Woking, has also disappeared under a mass of concrete nonentities! Portsmouth has changed in parts, mainly to satisfy traffic needs, but otherwise seems to remain substantially the same. I say nothing about the Guildhall Square! I was under the impression that the dreadful centre of Croydon was due to the after effects of Adolf. He flattened Sheffield and we suffered because the City Fathers slung up buildings post war rather than taking a breath and designing it properly. [To be fair, the bombed buildings needed replacement – but by better buildings.] As for Woking – it’s my nearest town, and a hole! I cannot find any excuse for what was done to the town centre. Certainly can’t blame Adolf for that one – although, arguably, Bracknell was even worse! Chris, I well remember Woking of yore before "developers" got it in their grubby paws. The last time I went it was as unrecognisable as the dark side of the Moon. In the late 1960s the old Tracco garage was the last operating base of those wonderful Lancet IIIs. Even Guildford, the sett paved High Street of which seems to feature in scenic postcards as frequently as Gold Hill in Shaftesbury, has had a grotesquely unsympathetic concrete circulatory system dropped down at the River Wey crossing. Betjeman’s poem about Slough springs instantly to mind, which brings me to David’s comment. Apparently, 1338 high explosive bombs and 5 parachute mines were dropped on Croydon Borough in WW2, though the old Victorian town centre remained surprisingly intact. The ‘planners’ then targeted what Göring had missed. From the mid 1950s onwards Croydon was a pioneer in the new order of ruthless redevelopment and heavy handed highway engineering. High rise buildings began to dominate the skyline turning the streets below into pedestrian wind tunnels; when I moved north in 1964 I found Bradford to be blusteringly similar. Thankfully, the Fairfield Halls were built as part of the Croydon redevelopment scheme. I, too, of have splendid memories of drama and music productions there, such as Alan Bennett plays, and a wonderful concert performance of Bartok’s Duke Bluebeard’s Castle amongst many, so there is a positive side to Croydon’s ‘regeneration’, though perhaps ‘mutation’ might be the more accurate word. Those Lolines above have sent us off on quite a journey! I wish that they were still around. On yet another tangent, I now see that the fine Norfolk Green business has been taken over by Stagecoach, so one more interesting bus livery bites the dust. Newcastle also suffered at the hands of corrupt developers and City Councillors. The two main protagonists were the architect John Poulson, and City Councillor T Dan Smith, who glorified in the name of ‘Mr Newcastle’. A High Court Judge had different ideas, and he was soon to become Mr Durham E Wing. Unfortunately, the damage was done. One result was that in the middle of the City you now have a half mile section of dual carriageway from nowhere to nowhere, they named after John Dobson, the 19th Centaury architect, much of who’s work they had systematically destroyed. The Hebble Valley viaduct is indeed an ugly monstrosity, and during recent weeks has once again been undergoing repairs to the side barriers and the deteriorated concrete which supports them. However, much as the landscape would be hugely improved without its domineering presence, I can not even begin to imagine how Halifax would manage without it now. The problem with not going ahead with the upper level of the flyover is that all the through traffic was then channelled onto the Burdock Way roundabout (where the A58 intersects with the A629) which even with its recent reprofiling and improvements is still a bottleneck and results in many accidents. An upper level would at least have removed the through A58 east-west traffic from the equation – ugly though it would have been. I can not think of any alternative road system which could deal with Halifax’s through-traffic predicament. As I understand it the design had to be modified, and the intended upper level abandoned following the controversy at the time regarding the safety of box-girder bridges. May I be allowed to vote in favour of Burdock Way? I think its rather good: not exactly the Millau viaduct, but as good as it gets in practical highways in the sky in those parts. The legend is, though, that Halifax retained most of its Victorian town centre because they could never agree on what to do the advantage, I guess, of hung councils. To swing back nearer the thread, I think we are inclined here (& not just here) to judge design by today’s standards & fashions when yesterday’s and tomorrow’s are/will be different. Functionality often is the design standard that lasts over streamlining (at 25mph), dorsal fins and Borisbuses. That is the appeal of the Routemaster or the Leyland or Roe bodies or even simple liveries relying on good colours or the wonderful statement of Sheffield cream we are going to be a clean city! Talking of future, is it the urban battery bus with a little diesel or ? engine for backup, like trolley batteries? Quiet, clean, no infrastructure…. You are absolutely right about Newcastle Ronnie. Thankfully they put T Dan Smith away before he did the same to Dean Street and Grey Street. However, even that didn’t stop the later tragedy when Stagecoach swept away the glorious yellow liveried buses that always brightened up those short winters days along Northumberland Street. There is a lot to be said about a good livery cheering up a town centre on a gloomy day! What wouldn’t I give now to do Leeds Manchester on a L5G or an X60 on a K type. By the way, the red on the Loline looks very deep and it may be a fault on the photo reproduction. Now I much preferred the East Lancs North Western Lolines for looks. I suspect because they had proper via indicators and the old "proper" fleet name and big numbers. They also took part in the old 52 service before the 29/30 to Macclesfield was double decked in December 1961 with those new Lolines, ruining all the interesting weekend extras that used to run. Oh that they had been delivered two years earlier in pre-1958 livery! I think Alexander double deck bodies are ugly. I recall taking part in an enthusiasts’ visit to North Western’s depot and workshops at Stockport many years ago, and talking to one of their engineers who was showing us around. He told me that in his opinion the Alexander-bodied Lolines were far superior to the East Lancs-bodied ones structurally and quality-wise. He said that though East Lancs. did build good quality bodywork if you were prepared to pay for it (citing the local Corporation’s Leylands), they were also quite prepared to build whatever the buyer asked for at whatever price they were prepared to pay, and that those Lolines were built to a low cost specification. Of course this has no bearing on their aesthetic quality and, as they say, beauty is in the eye of the beholder. Here is a Reading Corporation Dennis Loline III with an East Lancs H38/30F bodywork, and is seen arriving at Wisley Airfield for the "Cobham" Running Day on 4 April, 2004. The Loline, as most know already, was the Bristol Lodekka built under licence by Dennis of Guildford, and the Loline III with forward door makes an interesting comparison with the FLF version of the Lodekka. A beautiful picture of a beautiful vehicle. It has been said that arguably the best looking AEC Renowns are the East Lancs versions (particularly Leigh and West Bridgeford). This is the Dennis Loline equivalent – and equally good looking. The Reading livery helps to set it off. 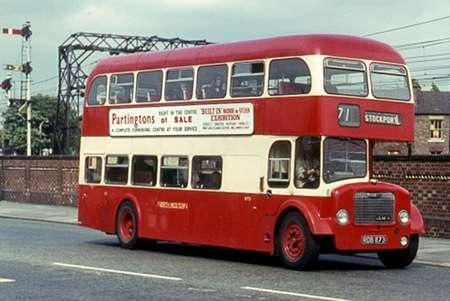 The forward entrance East Lancs bodied Loline III was the nearest the Loline got in looks to the FLF – if the upper deck emergency exit had been changed to a single bay the similarity would have been very close, with the visual advantage of a more balanced side window bay arrangement. Agreed on all points David – I just hope that Mr. Stenning doesn’t see the picture, or the poor soul will think that his life’s work has been in vain. Thank you, gents, for your kind remarks! This vehicle was one of the last batch of eight Loline IIIs bought by Reading in December 1966 and January 1967. The first eight Lolines for Reading came in September 1962, and had rear axles and four speed gearboxes by Dennis. These were followed by ten more in July-September 1964, but these had Bristol rear axles and five speed gearboxes with the overdrive ratio blanked off, which limited top speed to a shade above 30 mph. The last eight, of which 76 above is a representative, were similarly engineered. Quite why Reading specified the Bristol transmission components, especially the five speed boxes which the Corporation then blanked off, is puzzling. At this time Aldershot and District were accepting the delivery of Lolines equipped with wholly Dennis transmissions, so the Reading choice of Bristol componentry must have been made on the grounds of cost. The point has been made before on this site that the Loline, and particularly the Mark III, was rather more than "a licence built Lodekka". Dennis made several changes to the design, and all Lolines from the Mark I had a full air braking system, unlike the Bristol which stuck with air/hydraulic to the end. As one who has driven both Lolines and Lodekkas, I think that the Dennis was the nicer of the two types. Both Ian Thompson and Alan Murray-Rust who have first hand knowledge of these Reading Lolines in service have made insightful comments under the entry for North Western – Dennis Loline III – RDB 892. The Dennis Loline always lived in the shadow of the Bristol FLF in terms of sales numbers largely due to the radically different purchasing policies of the vehicles’ respective client base. Whereas the BTC companies, which were the only purchasers of the Lodekka allowed by legislation, standardised on a low-height design whether it was actually needed or not, the BET Group companies and municipalities only generally bought such vehicles where low bridges dictated a definite requirement. In those days before disabled access legislation no-one ever seemed to consider a major advantage of the Loline and indeed the other low-height designs of providing a low-height single step entrance. Had such legislation been in place in those days then the Loline could have had a very different history. I agree that this is a superb picture of a fine vehicle in a classic municipal livery. It still looks good nearly 50 years on but that is the mark of pure quality. Just realised—that’s me at the tiller and wife and daughter up aloft! From about 1955 onwards, as a new model popped up every few years and then disappeared from the market, you heard people predicting the final demise of Dennis as a busbuilder, yet here they are with highly successful products in 2013. Admittedly much changed, but the name lives on! I’ve also got a very soft spot for East Lancs bodywork, so that Loline has it all. Pity that one of the ’62 batch didn’t survive, but those then very saleable Gardner engines ensured that withdrawn 6LX-powered buses didn’t just moulder away as chicken sheds—to be discovered decades later by delighted enthusiasts—but got cut up for scrap. If you’d like a copy for posterity, the family archives, or whatever, I’m quite happy for Peter to forward it to you. Thanks for the very kind offer, Pete, which I’d be delighted to take up.